I’ve been tinkering around with the Whitebox character record a bit more. This version assumes armor determines a character’s movement rate, but retains the overall 20 inventory slots. It is perhaps not as realistic as tracking weight or some other systems that use inventory slots, but I think it gets the job done and is very easy to use. The chart in the book is much cleaner than my crude replication, but it gets the point across. Looking at the chart got me thinking about abstract inventory/encumbrance systems again. Instead of using pounds/weight for each tier, use abstract inventory slots instead, broken down into 5 slots per tier. A character can carry one item per slot, or 150 coins per slot. Further, characters are restricted to carrying a single “heavy” item, such as a suit of plate mail, small treasure chest, a marble bust, or a rolled up tapestry or rug. Really heavy items require two or more people to carry, and they count towards their limit of one heavy item (i.e. if you’re already carrying one heavy item, you can’t also help carry a really heavy treasure chest). So, starting at the top of the equipment section, as you fill in gear, you can just cross reference to see your current movement rate (and chance to drown, should you fall into water). It’s not perfect, of course. For one, it’s not as forgiving as the Whitebox chart it’s based on. Also, as you consume items, inventory slots will become empty in the middle of the chart, which can end up making tracking things a little more complicated (or else you’ll have to do a lot of erasing and writing things back into the upper slots); a little judicious forethought can minimize these problems (i.e. permanent items are recorded towards the top of the chart; consumable items recorded towards the bottom). Great action movie and a nice re-imagining of the Mad Max franchise. It’s not exactly a re-boot, but not exactly a direct sequel either. Pretty much a non-stop car chase, with plenty of post-apocalyptic weirdness you can steal for your PA RPGs. Go see it, whether you’re a fan of Mad Max or just a fan of good action movies. White Star has really gripped my imagination of late, so much so I’ve decided to start a second blog dedicated just to White Star material: Tales from the White Star Cantina. Henceforth, most White Star related material will be posted there, and I’ll reserve this blog for non-White Star RPGs. In the short term I’ll be reposting White Star material from this blog to the Cantina, just to get it off the ground, but in short order I fully expect to have new material: the Galaxy’s Most Wanted, Planets of Interest, advanced technologies, new classes, house rules, equipment, aliens, and more. Modern firearms have two modes of firing: single shot and rapid fire. Single shot attacks use standard combat rules: roll a d20, adding the attackers Base Hit Bonus and Dex modifier (if applicable) versus the target’s AC. As you would guess, a single shot attack only uses a single round of ammunition. Rapid Fire attacks fire several shots at once (minimum 2 shots), up to 10, 20 or 30 rounds, determined by the type of weapon used. RF attacks are not made against AC, but instead involve rolling a d10 for each shot fired: each d10 that rolls a 1 scores a hit on the target regardless of its AC. Roll damage for each hit scored. Each shot fired consumes a round of ammunition. Attackers may divide the number of shots fired between different targets. Simply divide up the dice and roll each batch separately. Example: A SMG can Rapid Fire 20 rounds in a single combat round (note: this is actually not very accurate for a 1 minute combat round, but some accommodation must be made for D&D’s abstract combat mechanics). Assuming a player decides to go all out, they consume 20 bullets and roll 20 10-sided dice. Each dice rolling a 1 scores a hit on the target(s). Creatures only hurt by silver weapons still require silver bullets to harm. 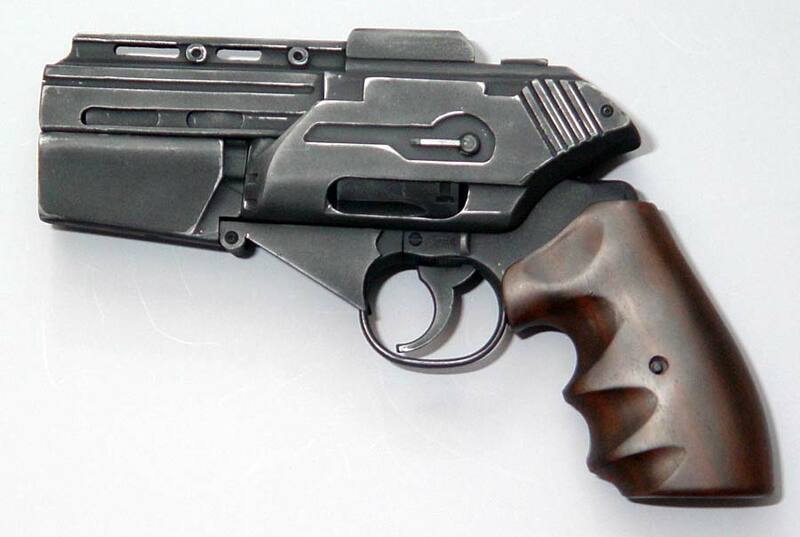 For those creatures only harmed by magic weapons, it’s left to the GM’s discretion whether modern firearms are equivalent to magic weapons, or whether actual magic bullets are required. Firearms are quite loud. Nearby monsters should be immediately alerted when guns are fired. GM’s may also want to consider making an additional wandering monster check every time firearms are discharged. GM’s should also consider whether sound suppressors are available, and what the trade offs for using them should be. One final consideration, ammunition should probably be rare or fairly expensive. Otherwise, your players will just load themselves down with ammo and blaze away at everything, relying on “spray-n-pray” to win every battle. Obviously, these rules should be applied sparingly against the PCs, especially at low levels. Conversely, even low-level mooks armed with assault rifles can make effective adversaries against high level PCs. Optional Rule: Mercenaries lose the Combat Machine ability and replace it with the Burst Fire ability, allowing them to roll d8’s to score hits, instead of d10’s. Optional Rule: Modern firearms can be reloaded very quickly, especially so in the context of a 1 minute combat round specified in Swords & Wizardry Whitebox and White Star. So, you may wish to “hand wave” reloading of firearms, assuming the PCs are proficient enough to reload very quickly and keep blazing away. This will have the effect of reducing some of the bookkeeping involved, essentially ignoring a gun’s ammo capacity. Optional Rule: You may want to adjust the target number to score a hit based on range. For example, rolling a 1 to 3 if the target is adjacent, 1 or 2 at short range, a 1 at long range, and 0 at extreme range. Well, White Star has got my creative juices following, so I’ll probably be on a bit of a White Star tear for a while. I already wrote up some simple feats for Swords & Wizardry Whitebox, and Crypts & Things (also based on Swords & Wizardry), so I thought I’d do up some feats for White Star, as well. Exactly how many feats to dole out to your PCs is left to the individual GM. Personally, I think I’d let players pick feats at levels 1, 3, 6 and 10, but you may feel differently about it. Unless otherwise stated, a feat may only be selected once. The GM may want to omit or modify some of these feats, depending on the kind of game they’re running. For example, if you’re running a Traveller-esque setting, where interstellar travel takes weeks, then you may want to omit the Hyper Comm feat for robots (which allows FTL communications). Likewise, if you’re not really enforcing the turn-based timing mechanism of OD&D, then you may want to tweak the Fast Healing trait for aliens. Per usual, please let me know if you have any questions or notice any errors. Cheers! Proton Grenade Proton Grenades are rare military-grade explosives which are impossible to acquire legally. 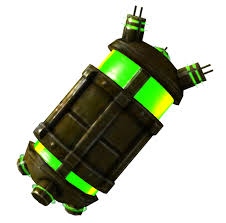 On rare occasions a batch of these potent grenades show up on the black market. Proton Grenades have a range of 30 feet, inflicting 5d6 damage to everyone within a 20 foot radius. Anyone caught in the blast radius is allowed a saving throw for half damage. Hand Nuke Hand Nukes are particularly dangerous explosive devices of unknown alien construction. They are nearly twice as heavy as standard grenades, and thus cannot be thrown as far. 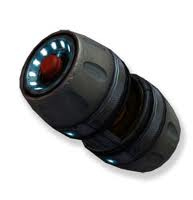 These grenades are considered highly illegal on most planets. Hand Nukes have a range of 20 feet and a blast radius of 50 feet. They inflict 10d6 damage, though targets are allowed a saving throw for half damage. I’ve had a chance to read White Star cover-to-cover, and overall I really like what I see. 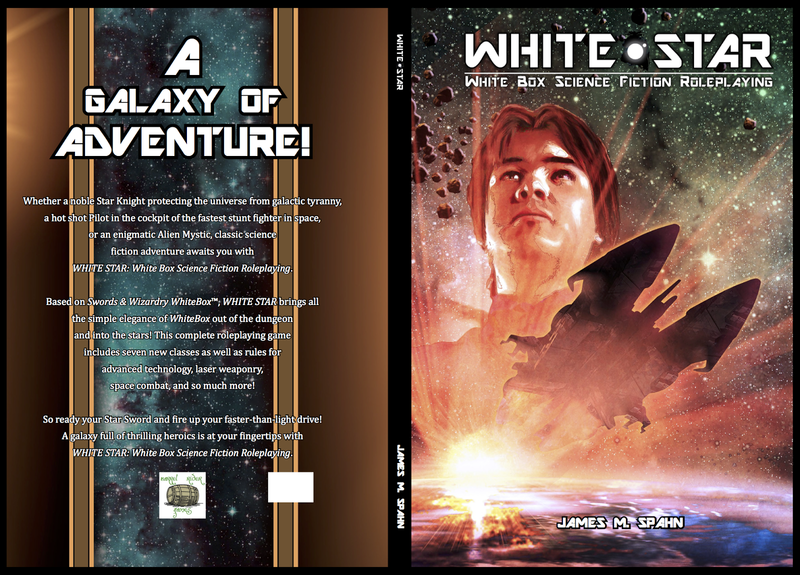 White Star, by James Spahn, is based upon Swords & Wizardry Whitebox, and the two games are fully compatible. Like Whitebox, White Star is very rules light. GM’s will be required to make rulings when situations inevitably arise that are not covered in the rules. Such lighter rule sets also leave a lot of room for tweaking, modding and house ruling. Both of these are good things, in my opinion. While it’s clear that White Star is heavily influenced by Star Wars, the game pays homage to virtually every sci-fi setting on screen, from Dune to Firefly to Battlestar Galactica…even Doctor Who. It just files the serial numbers off. The four primary classes are Aristocrat (think Leia or Lando), Mercenary (Boba Fett or Jayne Cobb), Pilot (Han Solo or Wash) and Star Knight (i.e Jedi Knights or, conceivably, Time Lords). In keeping with the toolbox nature of the game, alien racial classes are presented as archetypes: the Alien Brute (Chewbacca, Ookla or D’argo), Alien Mystic (Yoda, or Vulcans perhaps) and Robots. I really like this approach to aliens, as it is infinitely expandable, works with any setting you come up with, and avoids the author putting their thumb in your game. You could also have two Alien Brutes in your game, and yet they could be entirely different species. Combat works pretty much like it does in most D&D variants, just with lasers and star swords. And starship combat works just like personal combat, with the addition of Shields (which reduce incoming damage). In keeping with old school D&D, White Star has no formal skill system. This is one of the major differences between this game and other old school sci-fi RPGs, like Stars Without Number or X-Plorers. However, if you desire a skill system, it would be fairly easy to bolt one on. Say, steal the X-in-6 skill system from Lamentations of the Flame Princess, or base it on the thief’s percentile rolls. Personally, though, I feel White Star works just fine without formal skills. White Star has “spells” in the form of Meditations and Gifts, used by Star Knights and Alien Mystics (respectively). Both use D&D’s fire-and-forget spell mechanism. Overall the system works well, and is keeping in full compatibility with S&W Whitebox. However, considering Meditations and Gifts, and the classes that use them, are obviously inspired by Star Wars and The Force, I don’t understand the need to have two different sets powers. All the more so considering the relative paucity of Meditations and Gifts included in the base game. It’s an easy thing, though, to simply combine them into one group. Many of the monsters included are inspired by science-fiction movies: Daleks, Cylons, Klingons, sand worms, and many more, make an appearance, though with different names. It may seem a cheap and hokey addition, but as I was reading the game it felt like it somehow just works. I can easily picture a space dungeon filled to the brim with screaming Cannicks (Obliterate! OBLITERATE! ), ridge-headed Qinlons seeking honorable combat, and relentless Assimilants droning on about the futility of resistance. Advanced Technology details the “magic items” of the game. There’s a nice selection to get you started, including a small section on cybernetics. It’d be easy enough to add dozens more items inspired by sci-fi movies and books, or based on D&D magic items. Some magic items, like Ioun stones, are sufficiently exotic they could probably be ported over directly. 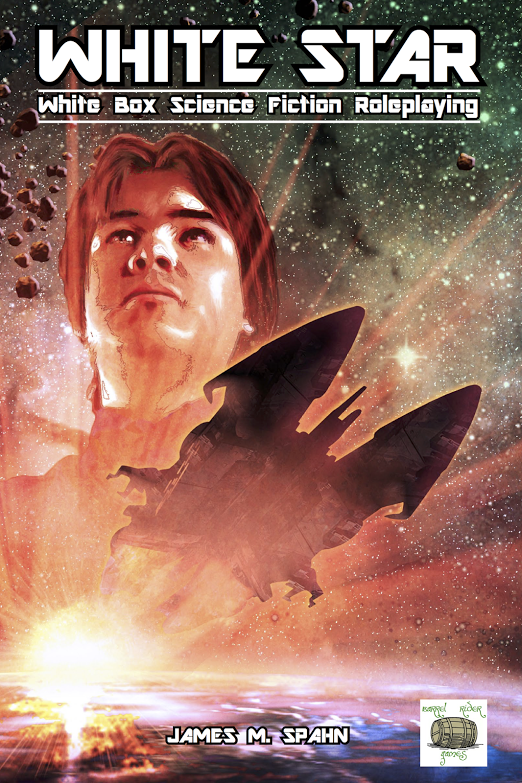 White Star is rounded out by a GM’s section providing suggestions for various campaign styles drawn from common sci-fi tropes; for example, rebels vs. empire, space traders, planetary invasion, murder-hobos with a spaceship (aka Firefly), and more. There’s also a sample space sector and a starting adventure. It would be nice to see a few additions. The game is missing a technical class (the pilot kinda-sorta fills this role, but not completely), and I think it could benefit from a thief-like ‘scoundrel’ class as well (again, the Aristocrat can fill this role, but that doesn’t feel like a good fit to me). Tables and charts for random encounters, as well as randomly generating planets and star systems, would also be a nice addition. In my opinion, White Star does a really good job of being Dungeons & Dragons in space. If that’s not what you’re looking for, if you prefer hard sci-fi settings, then this probably isn’t the game for you. But if you just want to pick up a star sword and kill Daleks and Cylons in the nearest derelict space hulk, White Star is the game for you. Btw, as far as I know, the 20% discount for White Star is still going. If you think you might have an interest in the White Star RPG mentioned in my previous post, you can get 20% off the PDF at Tenkar’s Tavern. I have no idea how long this discount will last. I’ve picked up the game and will give it a look over tonight, but will probably need a day or two to really digest it. Until then, cheers. PS: Normally I get around a 100 views per day, but my post about the White Star RPG set a new record for over a 1,000 views today. I can’t imagine a brand new OSR game could be that popular, so…WTF? Edit: Dug a little deeper. It seems someone linked my Beginner Box conversions over at Reddit. That explains it. Just wanted to give a quick heads-up about a new Swords & Wizardry Whitebox compatible game coming out tomorrow, called White Star. As you might guess, it’s a sci-fi toolbox using the Whitebox rules set. Tenkar’s Tavern has a quick preview of the first 56 pages. It appears White Star will have a generic Star Warsy vibe to it, but if you don’t want to mix space-mysticism with your starships and laser swords, it ought to be easy enough to cut that material out and put in the sci-fi stuff you do want. As for me, since it’s fully compatible with Whitebox, I’m thinking of combining certain elements of both games. I’m not sure I’d want space elves and space orks, but certain D&D monsters have a space-alien vibe to them. Things like Grell, Beholders and Mindflayers could be interesting additions to the game. At any rate, I’ll be picking up the PDF tomorrow and I’ll post my thoughts on the game in a few days, after I’ve had a chance to look it over. Cheers.